We think the best place for breakfast is on the veranda. Bring your own coffee beans, we provide the grinder. Mansa's Last Stop fruit and vegetable stand in Cades Bay (a 25-minute walk along the main road towards Charlestown) has freshly picked tomatoes, lettuce, onions, peppers, sweet potatoes, papaya, avocadoes, canteloupes, plantains, etc. (in season). Mansa also sells fresh local eggs, cold beer, staple groceries and bread, and he offers barbeque chicken and ribs on Friday and saturday afternoons. Charlestown (15 minutes by taxi or a "dollar bus," which is actually a minivan) has several grocery stores including BestBuy and SuperFoods, Nevis Bakery, a farmers' market, and a few vendors around the main square. Further down the road, south of Charlestown, is a big RAMS supermarket. Beer and soft drinks by case are sold at TDC Drinks Depot (469-5430/469-5282), 300 ft behind the TDC hardware/home goods store on the road towards Charlestown (just before entering the town). Restaurants vary from beach pavilions to fancy restaurants in plantation inns offering a five-course French menu (e.g., Beaujolais Nouveau Night at Montpelier Plantation Inn -- see the menu). Oualie Beach Hotel's restaurant is conveniently located just below. They have a beach buffet every Tuesday. But other options are definitely worth exploring. A short distance (5-10 min walk) down the road towards Charlestown is Gallipot, where grilled mahi-mahi or wahoo is simply prepared and delicious, grilled or steamed (the chef, Julian Rigby, also runs the deep-sea fishing business at Oualie). Their menu is quite extensive and includes steak, curried chicken, and vegetarian dishes. The place is open only Thursday through Sunday and can get hectic, and their style is not particularly welcoming. Reservations are necessary, especially on Thursday and Friday nights (469-8230). Coconut Grove (469-1020) is about two miles towards Charlestown. The atmosphere is more sophisticated and quite nice, and the service is very friendly. They have barbecue lunch on the beach by the pool, and offer a fixed-price dinner menu as well as a la carte selections. But Gallipot's menu, in fact, offers more variety and sophistication, and the food is better, at least to our taste. Next door is Yachtsman Grill -- very nice and friendly. They offer good all-you-can-eat fish and chips on Friday nights ($20 US), as well as a more extensive menu. Across the street is recently opened Indian Summer indian restaurant (469-5410). The food is very good and reasonably priced, but the dining room is not very cozy, so we prefer takeouts. Try Sunshine's Beach Bar and Grill for lunch or dinner. It is a fun place and the food is good and very reasonably priced. (In the evening, bring some insect repellent with you, just in case). The Four Seasons restaurant, closer to town, is predictably overpriced with mixed results. 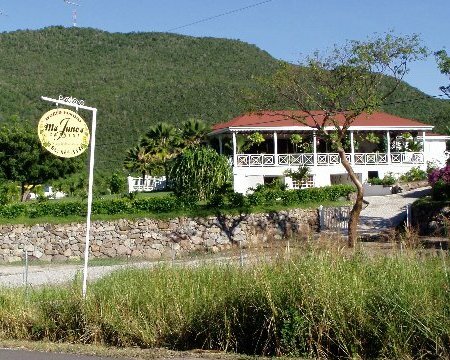 In the opposite direction from Oualie, a mile down the road, is a sign for The Mount Nevis Hotel (469-9373/4). 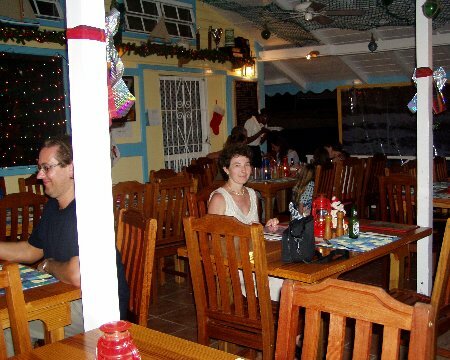 Their restaraunt has immaculate white tableclothes and perfect service, but in fact is pleasant and unpretentious, and the food is good and moderately priced, with a complimentary glass of wine or rum punch. They also have theme menus (for example, West Indies night on Thursdays, Mexican night on Saturdays). Further down the road, by the airport, is Sunrise beach bar/restaurant, under new ownership. The place is simple and good for a couple of beers (happy hour on Wednesdays); but the food seemed marginal and overpriced to us. There seem to be a pizza place further down the beach road. We never tried it; not even sure it is still open. A little further on the main road is Rumours and then, past Newcastle, pleasant and elegant Nisbet Plantation Inn. Its restaurant offers all-you-can-eat seafood barbecue by the pool on Thursdays followed by live music on the beach or, in case of rain, in the Great House, in a very informal atmosphere. Miss June's Cuisine is in its own league and should not be missed. Miss June Mestier came from Trinidad and has been hosting exquisite dinner parties for many years. These are by reservation only and you may need to reserve well in advance (869-469-5330).